The Treo 650 will be available as either a digital dual-band CDMA/1xRTT or a GSM/GPRS/EDGE quad-band world phone, with pricing to be set by individual carriers. Each carrier will make its own announcement on the release timing and price options. General carrier availability is expected to begin later this year in the United States, with worldwide rollout to follow in 2005. 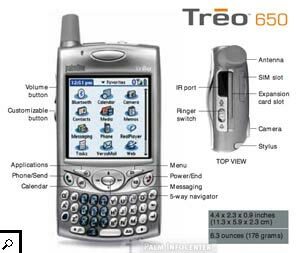 The Treo 650 improves upon the successful design of the Treo 600. The screen is a sharper 320x320 pixel high resolution 65,000 color TFT touch-screen display that offers improved visibility in sunlight. It also adds an improved camera, integrated Bluetooth wireless, a removable battery and non-volatile memory. The keyboard features larger and flatter buttons arranged in a smile pattern. The keys also have an improved backlight for use in dark situations. The launcher and menu keys have been moved around the 5-way to create a central navigation region. More phone like green and red "send/end" buttons have also been added. The VGA camera has been improved to take better pictures, especially in low light situations. It now features video capture and playback, 2x digital zoom and a small fixed mirror for self-portraits. 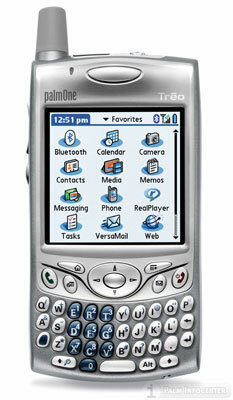 The Treo 650 runs Palm OS Garnet v5.4 on a 312 MHz Intel PXA270 processor. It includes 32MB of non-volatile Flash RAM (of which ~23 MB is user accessible), that will stay preserved even when not charged or the battery is removed. It has dimensions of 4.4 x 2.3 x 0.9 inches (11.3 x 5.9 x 2.3 cm) and weighs 6.3 ounces (178 grams). The built in expansion slot can accommodate MMC, SD and SDIO cards. However, it will not support the palmOne WiFi SD card at launch. palmOne claims to be evaluating the situation, so there is only a slight potential the card will eventually be supported. The Treo 650 comes with a 1900 mAH Li-ion rechargeable battery that can be removed. Additional replacement batteries will be sold by palmOne for $59.99 USD each. Battery life for GSM models is rated at 6 hours talk and 300 hours standby, while the CDMA version gets 5 hours of talk and 300 standby. The 650 includes the new Multi-Connector for recharging and hotsyncing the Treo via a cable. The Treo 650 now comes with much of the same software as the Tungsten line. This includes palmOne enhanced PIM suite, the Blazer web browser v3.0, VersaMail v3.0, the Real Player for mp3 audio, and Dataviz Documents to Go v7 for Word, Excel and PowerPoint Microsoft office files and email attachments. With VersaMail's support for POP and IMAP email servers, users can download mail wirelessly or by synchronizing with their desktops. For Enterprise users whose organizations run Microsoft Exchange Server 2003, the Treo 650 has built in Exchange Server ActiveSync that will directly import and enable corporate email and calendar synchronization. The Treo 650 lets users send and receive sms/mms text messages, photos or video clips right away from one application with a single inbox. And with text messages threaded in a IM chat-style view, users can see the entire conversation. With Calendar, Contacts, Tasks, Memos and more, the Treo 650 lets users organize and simplify their business and personal lives all in one place. Users can dial contacts by name from their contacts list or enter a name or number on the QWERTY keyboard or on-screen dial pad. Speakerphone, speed dial, conference calling, call history, and caller ID are there for managing calls. "Today's mobile society needs to be productive while on the go without sacrificing access to important personal and professional data. With the Treo family, customers can be even more effective and efficient because of our seamless combination of mobile phone, email, organizer, web browser and messaging," said Ed Colligan, president, palmOne. "Treo smartphones let people do what they want, when they want and just about anywhere they want." 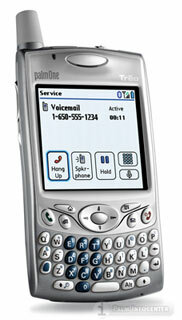 The Sprint Treo 650 is now available for pre-order.